Specialty Concrete Forms, available for rent or for purchase from the Duke Company in Rochester NY, Ithaca NY and Western New York. Renown for exceptional quality, productivity and safety, Steel-Ply specialty forms are used for Bulkhead Forming, Haunch Forming, Pilaster, Adjustable Pilaster Forms, and Culvert Forms. Bulkhead Forms & Keyway Forms: available in a range of lengths including 3 foot, 4 foot, 5 foot, 6 foot and 8 foot. Notably, when adjoined to bulkhead bars, these forms result in a keyway and buttress the waterstop into the right place. In addition, the bulkhead bars are rented and purchased by professionals to form bulkheads in wall structures from 4 inches to 24 inches wide. our Steel-Ply brackets, enable for rental or purchase, enable secure set-up of both haunches and corbets, and do not require additional support from lumber. The haunch brackets are specifically designed to support 3/4 inch planks of plywood. 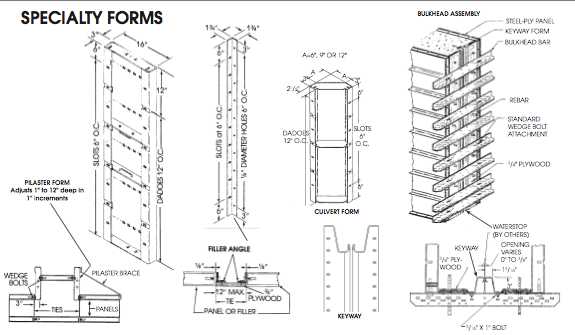 Creating architectural columns is a straight-forward and efficient process by renting or buying the Duke Company’s Steel-Ply panels and corners (Inside and Outside). Pilaster’s are adjustable and available in 1 inch to 12 inch forms. Available for rent from the Duke Company, our CAD team can assist you in selecting the culvert forms for you project. Available in 3 foot, 4 foot, 6 foot and 8 foot lengths, culvert forms are available in 6 inch, 9 inch and 12 inch widths.